Conducting performance reviews of trade contractors/vendors as well as your team is important. ey can provide good knowledge on how to improve in the future, and you may need to determine their suitability for future work. In some cases, you may need to choose how or whether to give negative feedback to a trade contractor. It may not be pleasant but is important to the relationship if you want to continue working together. PROJECT FILE Likely you will have a more detailed file internally than what is provided to the cli- ent. Here, too, you can do this work incre- mentally, such as by phase to help make it manageable and reduce effort at the end. Consider making a digital file rather than, or in addition to, a paper file. e file should include: ¡ Baselines and final actuals for cost, schedule and quality ¡ Planning documents ¡ Work and purchase orders ¡ Work contracts ¡ Warranty information ¡ And lessons learned. PROJECT TEAM Provide performance reviews for your team members. ese can be difficult but are key to improving the future performance of both the company and individuals. is process is also a good time to get input on your per- formance as the project manager from the team member's perspective. | architects or interior designers. Even if they haven't asked but such stakeholders have been involved along the way, it is good to verify with the client whether he/she expects or as- sumes such final inspections will be done. Better to add them now than have them come up after you believe all is done. Providing a final summary is always valuable and shows the client you took care with the work and delivered what was promised. Providing the client with a well‐organized, easy-to-use packet of project documents can help with the client relationship and increase satisfaction. is is likely an important record the client will save and use to document improvements for tax pur- poses or when they sell later. is final summary also protects the remodeler. Client feedback should be solicited. is can be done by a member of your staff or by a third-party vendor. However it is handled, it must be safe and easy for the client to an- swer, especially to give negative feedback. e feedback must be reviewed and shared with the team. It cannot be stressed enough that negative feedback must be addressed, and ac- tion taken to correct with the client, to prevent it from happening with the next client. JOBSITE Closing out the jobsite includes such things as conducting a thorough clean-up, collecting and deciding what to do with any unused items, removing any equipment, and return- ing any rented items. Ideally, this would be done in a clean and remove "as you go" fashion so that at the end you are just verifying the space is clean and clear of tools. STAKEHOLDER Just as you verify the WBS items with the client, you also should verify work is complete with all trades, contractors and vendors. Make sure payments are made and get waivers of lien with the final payments. he closing phase of project man- agement often gets the least atten- tion of all the project management phases. Closing a project provides a great opportunity to your company as well as helping to cement the client relationship. ese activities increase the likelihood of get- ting a referral and/or additional sales. During this phase, the project manager needs to follow best practices to ensure all project pa- perwork is complete. is includes the final inspections, verifying final client approval, gathering client and stakeholder feedback, and preparing the final project file. Using informa- tion gathered during this phase, you should also update your company processes and procedures and share what you learned. As noted, closing may be rushed through or glossed over, and that can create a host of problems. For example, your company may want to redeploy people quickly into other jobs. As the team dwindles, the interest and energy wanes, and people move on mentally. All result in the likelihood of not capturing learnings, which can lead to making mistakes again or not finalizing things cleanly with the client, which can possibly result in follow‐ups later or reduced client satisfaction. 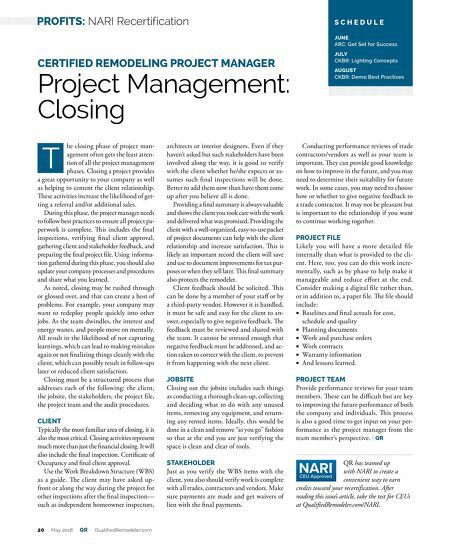 Closing must be a structured process that addresses each of the following: the client, the jobsite, the stakeholders, the project file, the project team and the audit procedures. CLIENT Typically the most familiar area of closing, it is also the most critical. Closing activities represent much more than just the financial closing. It will also include the final inspection, Certificate of Occupancy and final client approval. Use the Work Breakdown Structure (WBS) as a guide. e client may have asked up- front or along the way during the project for other inspections after the final inspection— such as independent homeowner inspectors, T S C H E D U L E JUNE ARC: Get Set for Success JULY CKBR: Lighting Concepts AUGUST CKBR: Demo Best Practices CERTIFIED REMODELING PROJECT MANAGER Project Management: Closing 20 May 2018 QR QualifiedRemodeler.com PROFITS: NARI Recertification QR has teamed up with NARI to create a convenient way to earn credits toward your recertification. 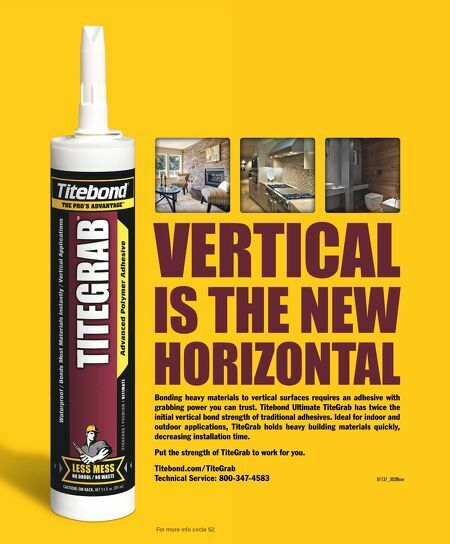 After reading this issue's article, take the test for CEUs at QualifiedRemodeler.com/NARI.